While that may seem like an exaggeration, in reality it is probably not too far from the truth. Growing up as an Oregon fan, I had a glorified image of Autzen Stadium, dreaming of one day running out of that tunnel into the welcoming arms of a vibrant and deafening sea of green and yellow. My dad’s stories (which at nine or ten years old seemed like Greek mythology), from when he quarterbacked South Eugene High School in the 1970s in that very stadium, accelerated that image. I could hardly believe that my dad had thrown the ball on the same field as Joey Harrington. When I arrived at my first game in Autzen Stadium back in 2009, I realized that the glorified image I had in my head was more reality than fantasy. The towering bowl surrounding me, topped by an undulating rim of cement that seemed miles high, captured and trapped the noise and enthusiasm emanating from each and every individual to a degree that was almost overwhelming. My only disappointment came when I took a look down at that tunnel from the student section. I couldn’t help but feel a sense of sweeping disappointment that I wasn’t down there on the field. More than anything, I wanted to be a part of the team. But when the Ducks trotted out onto the field, it quickly became clear that I was part of the team. We all were. When the Ducks were on defense, we made sure our foes couldn’t hear themselves think. When the Ducks were on offense, you could hear a pin drop. One detail that my dad left out of his high school stories, however, was that Autzen wasn’t always quite that prestigious. It has a long, rich history of development and improvements that deserves to be appreciated. 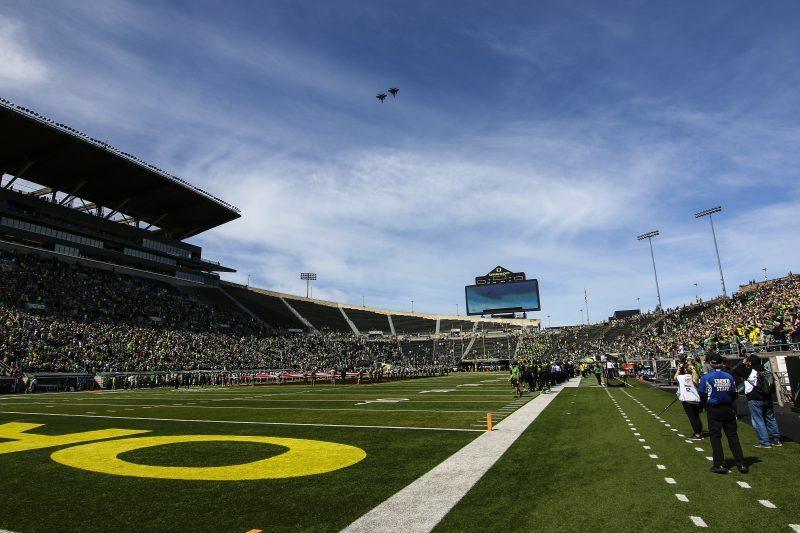 Autzen was far from Oregon’s first venue for football games. In fact, the Ducks had played their home games at five different fields before the 1967 construction of the stadium we know and love today. 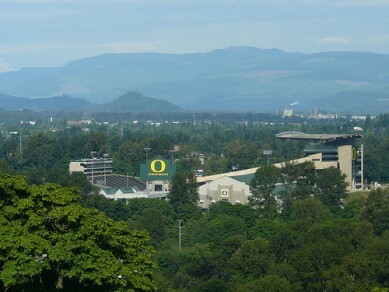 The Ducks’ battleground prior to Autzen’s construction was Hayward Field, an image hard to conjure up today, as the field is now known as a prominent site for track and field rather than football. Unfortunately, Hayward Field didn’t have the capacity to host some of the bigger football games against opponents like USC and Washington, so the Ducks had to travel up to Multnomah Stadium in Portland to take on multiple in-conference foes. It was a beautiful day for SNL at Autzen Stadium. The construction of the initial stadium in 1967, therefore, was much needed. In his twentieth and final season as Oregon’s athletic director, Leo Harris gave the Ducks a parting gift by paving the way for Autzen’s creation. The process was surprisingly quick and relatively cheap, costing $2.5 million and taking only nine months. 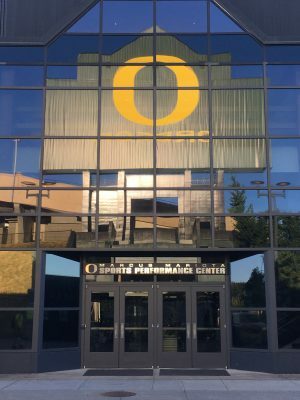 The facility was named after Thomas J. Autzen, a Portland lumberman whose Autzen Foundation had contributed significantly to its construction. The Ducks played their first game in the stadium on September 23, 1967, which resulted in a tough 17-13 loss to a heavily favored and nationally ranked Colorado team. However, Oregon didn’t have to wait too long to christen their new home with a victory, defeating Idaho 31-6 only a few weeks later. Though the field was originally natural grass, it soon received a makeover and its first transition to artificial turf in 1969. What eventually came to be known as Rich Brooks Field in 1995 has seen numerous turf-related upgrades in its lifetime. In 1976 the turf was replaced only to receive an upgrade to OmniTurf (sounds nice and futuristic, doesn’t it?) eight seasons later in 1984. As valuable and luxurious as the new turf and Barker Stadium Club were, one of the most drastic improvements to the stadium came on the south side before the 1988 season, an addition that coincided with the Duck’s ascension out of a decade of mediocrity behind quarterback Bill Musgrave. A good-looking, lavish set of press boxes and skybox suites were added to the already visually appealing southern rim, complimenting nicely the steep mountain of green seats on the south side of the stadium. The revenue that stemmed from the leases of these press boxes ended up funding the construction of the Casanova Athletic Center in 1991 as well, further proving it to be a good investment. A gorgeous Fall sunset behind Autzen’s enormous DuckVision screen. One final key addition to the stadium’s rim came in 1998 with the $4 million MegaVision display scoreboard. Now endearingly known as DuckVision, the 88 foot by 56 foot screen sits on the west side of Autzen in front a gorgeous fall sky backdrop, constantly showing replays and player profiles, not to mention goose bump-worthy highlight videos before each game. In 2002, the field received its first upgrade to FieldTurf, which was far more weather and temperature resistant than the previous OmniTurf (even though we all know that it never rains in Autzen Stadium). Until the 2010 season, Rich Brooks Field also had a famous and noticeable crown, as the center of the field was higher up than the sidelines. However, the field received yet another makeover when the surface was leveled off in 2010. Clearly, Autzen Stadium has been through a lot over the span of its relatively young 46-year life. The constant maintenance has paid off, as the stadium has unquestionably become one of the most impressive and feared venues in college football. 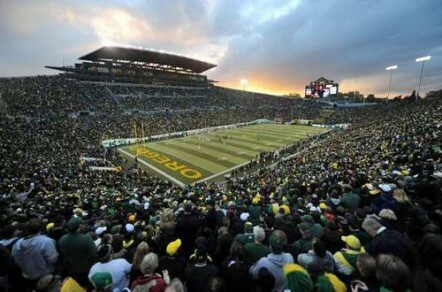 Though its capacity barely eclipses 60,000 fans even including standing room, Autzen remains atop the list of the loudest stadiums in the country with the likes of Michigan Stadium, Ohio Stadium, and Alabama’s Byrant-Denny Stadium (which all hold over 100,000 people). Best could feel the Oregon fans behind him. Their enthusiasm and loyalty help to maximize the noise in Autzen at all times. “That’s the loudest stadium I’ve ever been in,” said former Michigan head coach Lloyd Carr. As Duck fans make their pilgrimage on game days across the footbridge over the spectacular Willamette River and into the beautiful forested walking paths of Eugene, the anticipation builds. And when they come around that final bend in the woods and see their beloved Autzen Stadium, an overwhelming, enormous man-made sanctuary in the middle of some of the region’s most visually stunning nature, it’s hard not to feel like a part of the team. 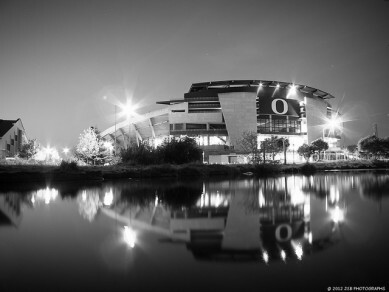 Autzen has come a long way since its original erection in 1967, and now we Duck fans can be thankful that our team has one of the best and most feared college football stadiums in the nation.